Here is a picture of a little guy I found munching around our house this morning. I named him Soup because the first thing I thought was Turtle Soup. I have never tasted Turtle Soup and I’m not sure I want to. I am open to new things however. Soup will not be turned into soup as I only put him in a dish with fresh water and garden lettuce until I can show him to my husband. 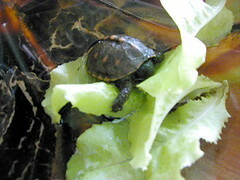 Soup doesn’t seem to want to eat the lettuce and, for the time being, will only hide under it. My gosh! Soup is only an inch long! After hubby sees him he will be turned back into the wild near one of our ponds. We do have some ugly huge turtles worthy of soup in those ponds. I snagged a turtle soup recipe from the internet and am storing it here for future reference, just in case I ever catch one of those huge turtle pond monsters. The ugly huge turtles are one of the reasons I quit swimming in our ponds. As they sometimes say…Pay backs are hell. Melt 8 ounces (2 sticks) butter in a heavy saucepan. Add the flour and cook, stirring frequently, over medium heat until the roux is light brown. Set aside. In a 5-quart saucepan, melt the remaining butter and add turtle meat. Cook over high heat until the meat is brown. Add celery, onions, garlic and seasonings, and cook until the vegetables are transparent. Add tomato purée, lower heat and simmer for 10 minutes. Add the stock and simmer for 30 minutes. Add the roux and cook over low heat, stirring, until the soup is smooth and thickened. Correct seasoning with salt and pepper to taste. Add lemon juice, eggs and parsley. Remove from heat and serve. At the table, add 1 teaspoon sherry to each soup plate. 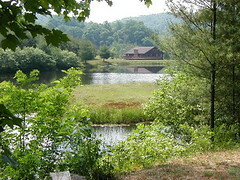 It is amazing what one can find right in their own backyard. I was on one of my nature walks outback of our home. 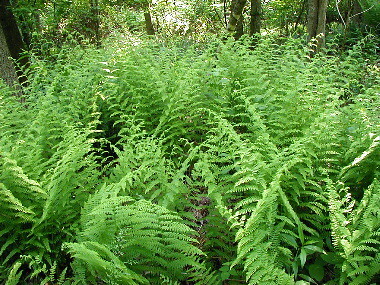 I ran upon these ferns that were as tall as me. They were growing alongside our wooded path, all grouped together like thoughts of safety in numbers. How beautiful! On another note as this is suppose to be a food blog. 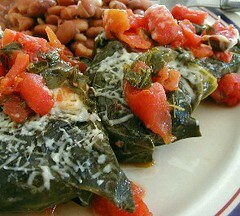 A way to use those outer cabbage leaves that you would normally trash are cabbage rolls. The outside leaves are tougher than the heart so this is the only way I ever use them. This recipe is a great way to use some of your garden basil, oregano, onions and cabbage. Fresh tomatoes are great in it too, but ours just aren’t ripe yet. Wrap cabbage leaves in moist paper towels and microwave on high for 2 minutes to soften. 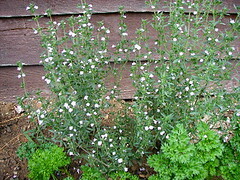 Cut off the thickest, white portion of the spine of each leaf, set aside. Combine beef, rice, water, bread crumbs, spices, onion, garlic, egg, salt and pepper in a large bowl; mix well. Spoon about 1/4 cup of beef mixture onto the center of each leaf. Fold up bottom of leaf to cover filling, tuck in sides and then continue rolling to make loose rolls. Heat oil in a large pan over medium-high heat; add rolls and saute until golden brown about 5 minutes. Remove carefully and wipe pan of excess oil. Replace rolls then add tomatoes, chicken stock, fresh basil and oregano to pan. Bring to a simmer. Reduce heat to low, cover and cook until cooked through, about 1 hour to reduce liquid. Sprinkle on cheese and serve when melted. I planted savory for the first time this year and it is getting leggy and blooming and taking over. I don’t know what to do with the stuff! 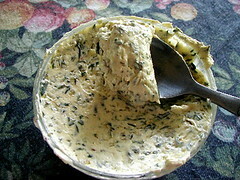 I have a recipe for savory butter that goes well on vegetables and pasta but what else can I do with it? Blend together all ingredients and spread on vegetables or pasta. If you can help, please post and leave a link so I can come snag the recipe. Thanks forever and ever! I have not been online much since my grandbabies, and my herb garden is suffering also.